Check what you select before deleting so that you do not delete items unintentionally. Select a component. To remove multiple components, select the parent container of the components. 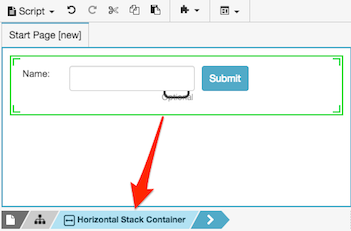 If a parent container is selected instead, the indicator displays “Horizontal Stack Container.” In this example, everything inside that container is selected for deletion. 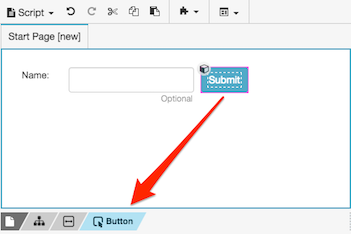 To delete the selection, click the Delete Component icon in the component properties. If the component is a container, all components that it contains are also deleted. Tip: Do not press the Delete key. Click the Delete Component icon instead. Modern browsers, such as Chrome, interpret delete as a shortcut to go to the previous page in the browsing history for the tab. That effectively closes the script editor, losing any edits you have not saved. You can undo component-level changes such as adding, moving, or removing a component. You cannot undo property-specific changes such as the color of a component, its position, and so on. Redo performs the inverse of undo. It restores component-level changes, but not property-level changes.